Thank you all so much for supporting my 24-hour walk for 826Chi. This idea started off as a “Wouldn’t it be nice if…” and has turned into $1700 plus for a great charity that helps kids learn how to be more confident in communicating their ideas and turning intangible thoughts into something in the real world. I’d like to say I’m surprised by how much the campaign earned, but I won’t, because I know I’m friends with some incredible people. Thank you, thank you, and if 826 shares anything with me about how they use the funds or what projects spring out of it, I will be sure to share. Another bonus to this campaign – my feet didn’t fall off! I’m attaching my FitBit screenshots so you can see what I did during the 24 hours yesterday. Yearning to recapture something you lost, long, long ago? Isn’t everyone? 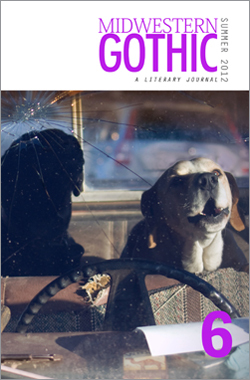 Issue 7 (Fall 2012) of Midwestern Gothic helps you do just that! We’ve had this special issue of Midwestern Gothic in the works for a long, long time, and I’m incredibly excited to unleash it on the world. 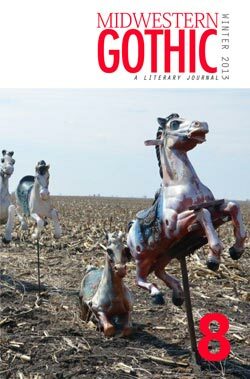 We love publishing contributors in Midwestern Gothic more than once, and that’s never been more true than in this issue. We reached back out to a lot of our favorites from our still-fledgling six issue history, and just about everyone gave us something back that we loved. And we’ve got some fresh blood, new contributors to throw into the mix, and they’re no slouches either. One of my favorites, though, comes from a past contributor, Abby Norwood. Anytime anyone asks what my favorite story is, I’m able to tell them without question it’s her short, “Spider on the Wall,” (Issue 4). When she submitted again, I had high hopes and high expectation, and again, she floored me. What she does with characters and emotion just hits a nerve with me every time. Bean sat naked on the edge of his bed—naked as a baby bird, his mama would say if she saw him, but Mama was lying in her own bed with a wet cloth on her forehead and the shades all drawn, and like that she couldn’t see a thing. He’d ridden home from the funeral on Mama’s lap and while Aunt Dee made Mama some tea he’d slipped into his bedroom and out of his black suit. He’d balled it up and thrown it in the trash, the whole thing—jacket, slacks, dress shirt, Transformers briefs, clip-on tie. He sat there naked and put his fingers over the bruise on his upper arm. Five bruises, really, one from each of Daddy’s fingers squeezing Bean hard when he’d spilled juice on the carpet a few days before. Bean held his hand over the hand-shaped bruise and looked at the pile of funeral clothes in the trash. Daddy hadn’t liked to wear things like that and he got too dirty at the refinery for suits, but sometimes he’d dress up for a job interview or a wedding. After Mama’d gone to bed the past two nights Bean had snuck into her bedroom and he’d pulled some of Daddy’s sweaters and slacks and undershirts onto the closet floor to sleep on. Kind of like the little nests Daddy’d build on the floor next to his bed, the piles of blankets and pillows, a safe place for Bean to sleep when the thunder from a summer storm grew too loud or the lightning too bright. Bean’s nest in the closet wasn’t as soft, but it smelled like Daddy, like Old Spice and sandalwood and whiskey. He’d buried his face in the sweaters and folded himself up to fit under the tees. The smell helped Bean sleep. Grab yourself a copy of Issue 7 and check out the rest. You won’t regret it! 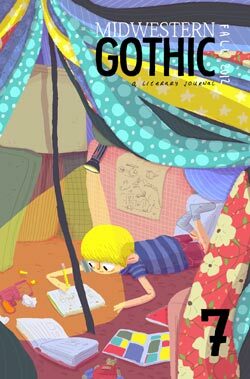 Kick back in a hammock and chill with the latest issue of Midwestern Gothic. Honestly, this is probably my favorite cover. I can hear those dogs whining and howling in my head – awesome. The guts of the book are pretty sweet too. The story that stood out most to me in this issue was Makeup by Hadley Moore. It’s about a woman, marred with a wine stain birth mark, and a gift of cover up makeup from her well-intentioned mother. Anne Marie hadn’t worn makeup in nearly thirty years. The last time, she was ten and had filched some cheap drugstore stuff from her parents’ bathroom. She’d glopped it on and walked down the street to the playground. She wanted to see what it was like to be out in public as a different girl, a regular girl. Since then that was the only kind of attention she could expect from boys— and now men—not cruelty, just this matter-of-fact disregard. You’re still ugly, Anne Marie told her reflection. You’re still ugly. The story explores a lifetime of layered judgements upon the main character, to the point where it stifles her, and deftly introduces a new layer in a way that forces her to see herself in a new light. All in all, loved it. Every summer, I let Miles pick a project to tackle. Year 1 was finding a dinosaur fossil. Year 2 was making a movie (totally fizzled out). Want a shortcut to the video of the flight? This year, he said he wanted to send a rocket to outer space. I thought for sure it’d be a bust too. After all, I don’t have the cash to pay a bunch of rocket scientists. And even if I did, you can bet I don’t have the guts to pull off something like these guys did. But then I remembered a video I’d seen awhile back of some guys who sent an iPhone 4s into space. They used a weather balloon – so why couldn’t we? With that settled, I let Miles draw up the design for the rig. It was actually pretty close to what we ended up building. I did a refined sketch, and then we set about making the thing. I knew we’d need to tweak things along the way as we figured it out. These were some of his sketches that didn’t make the cut. It was actually kind of hard to find a weather balloon – there were a few on eBay and one listed on Amazon, but other than that, what I was uncovering wouldn’t really work for us. I settled on the Amazon balloon, which would hopefully make it to 70,000 feet, past the 65,000 foot border that marks near space. We’d fill the balloon with helium (I’m not brave enough to do hydrogen. And I have no idea why anyone would be) to a diameter of 6 feet. As it rises, the gas inside expands until the balloon reaches its bursting diameter of 20 feet. After the fact, I found a company that manufactures high altitude balloons. They’re more rugged and will travel higher, but a touch more expensive. I ended up buying another one for a backup balloon, just in case something went awry. Can we capture pictures or a video? Can we find it when it comes back down? Will the equipment survive the return impact? Will the batteries stay warm for the entire journey? Will it reflect a radar signal? How do we slow the descent? Slap it all together, and the whole thing weighed about 1.5 lbs, which was awesome. We painted the cooler bright red and wrote our phone number all over the outside with the promise of a $50 reward if someone else happened to find it. I suppose we could have sent it straight up, but I wanted to make sure everything would work as planned to iron out the kinks. This is our test list. One test was with just the phone, in an area with little to no cell signal, trying to mimic not having a 3g signal in space. It only ate half the battery in 4 hours, so I knew we were good. The second was putting the whole rig together, starting up the camera and the battery, and shoving it in the freezer to mimic (or as close as possible, the -60F temperatures of near space. We passed this test too with flying colors, so we were ready to go! With all systems go (and weather cooperating), we headed all the way out to the Iowa border and the Mississippi River to send it up. Because FAA regulations dictate how close you can be to airstrips, and the fact that the prevailing winds would probably send our project to the west or southwest, I didn’t want anything coming down in Chicago or in Lake Michigan. We settled on the Hanover Bluff Nature Preserve, and found a little clearing on public land to set up our gear. With a tarp spread on the ground to protect the balloon, we secured it to two five-galloon jugs of water BEFORE filling it up. This was the smartest decision we made, in hindsight. To save batteries, I didn’t put the cooler together and start up the camera/GPS until AFTER it was inflated, which meant Miles was in charge of hanging on to the fully inflated balloon. He did a pretty good job for the most part, but it did slip from his grasp a couple times. Luckily, the zip ties held. With everything together, I called the FAA and Sandi to double check that the GPS was transmitting correctly. I’ve never been more annoyed that my work phone demands a complex password to unlock it – my hands were shaking the whole time and I had to unlock the thing at least five times. We’d done all we could – it was ready to go up. Miles did the countdown and cut the string holding it to the ground. The scissors misfired a couple times, but he got it without help and the balloon was soaring. After we watched it disappear in the sun, there really wasn’t much to do other than clean up and go get lunch. Above 5,000 feet, the cell signal vanished and the GPS location stopped transmitting. Expected, but perhaps not at such a low altitude. We made a quick meal of Nachos Bell Grande and a Crunchwrap Supreme at a Taco Bell in Savanna, IL, and Miles commented on how this little town was a “cowboy city”, because there was so much wood paneling. Thanks to a website that we used to predict our balloon’s path, we had a rough idea where it would end up. We started driving, not sure when or where it might come down. We didn’t have to wait long, after only a half hour in the car the GPS signal came through again, and it was on the ground! Sure enough, it was in the general direction we were traveling – but it had gone 50 miles already! I reprogrammed our driving directions – and we were off. About two miles out from the crash site, something disturbing happened. Miles pointed out the window and said, “Daddy, look! 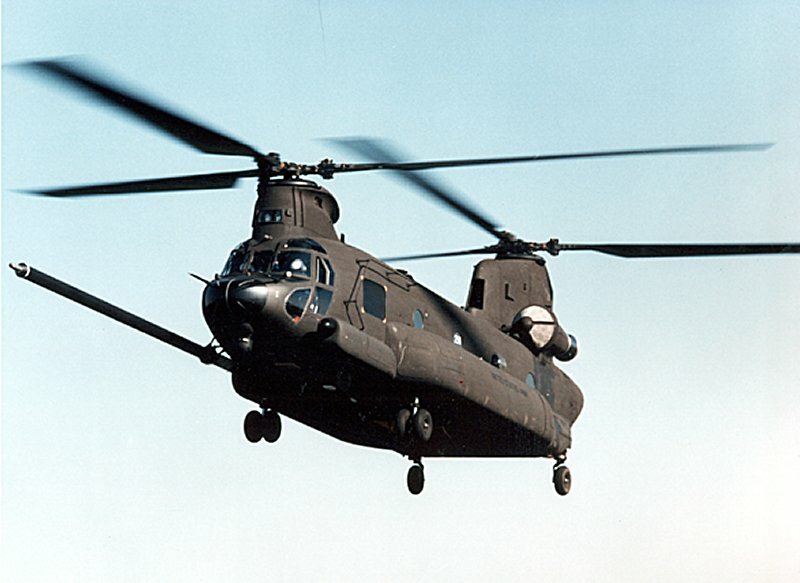 A helicopter.” One of these bad boys was flying over, in the exact direction of our balloon. Umm…uh oh. Turned out to be a coincidence. A very, very, scary coincidence, but we never saw the chopper again, and we didn’t end up in federal prison. The balloon had fallen on what looked like the border of two farmer’s plots of land. The owner of one plot wasn’t home, so we asked the other if we could walk back there and try to find it. They agreed, and we trekked around the edge so as to not trample the soybean plants he’d sowed. Miles got a stitch in his side, and it was hot, but we finally made it out there. At first, I thought the GPS was wrong, I didn’t see the red cooler or the deflated balloon. But it was in a corn field, and they were above ankle height. I stepped into the rows, looking up and down, and was rewarded with the site of the cooler. I called Miles over and asked him to look, so that he could feel like he’d found it first. At the start of the day, if we’d gotten the balloon off the ground and lost everything, I’d have been happy. But we not only did that, we got our equipment back and got footage of the whole journey. A resounding success. If you haven’t watched it already, here’s the video I put together. Most of the footage was of the camera spinning, so these are the best, most stable bits. Our balloon popped too early, because wind caught the rig and made it tumble at around 50,000 feet. The balloon should have gone to 70,000 feet before the gas expanded enough to cause the balloon to burst. This is the projected route, and the actual route on a map. The rig needs to be modified to handle the wind better. It spun the whole time, and the tumbling at 50,000 feet meant the balloon popped to early and couldn’t reach its full height. Put the rig together before filling the balloon. Now I know how long 100 cubic feet of helium takes to fill, and we had plenty of battery and camera space leftover. Sea of Trees, Robert James Russell’s inaugural novella from Winter Goose Publishing needles at one of the darkest moments in the human experience – when a person decides to commit suicide. But the prose refuses to be bogged down by the weight of the subject matter, instead forging relentlessly through an ever-darkening forest with the promise of thinning on the other side. The novella covers one main story arc, that of Bill and Junko as they walk in the footsteps of Izumi, Junko’s troubled sister, who came before. Interspersed within are self-contained vignettes that focus on a different suicide in the Aokigahara Forest in Japan, one of the world’s most notorious suicide locations and the backdrop of the main arc. Each vignette pushes you deeper into the darkness of Aokigahara, until you look around and realize there is no way back. Bill, playing the role of the naïve narrator, serves as a fine point of view as Russell leads us through what is truly Junko’s journey. He’s American, fails to fully grasp the Japanese culture and sees their trek through the forest as something he can return from unchanged. The fact that his focus is mostly on Junko’s physical beauty and the potential for a liaison underscores how oblivious he is to the dark path she is leading him down. The intertwining of the narratives, the naiveté of the narrator and the increasingly frantic Junko all spiral towards an inevitable conclusion, like a tightly controlled whirlpool from which there is no escape. Bottom line – read this book, however you can get your hands on it. You can also find the indomitable Robert James Russell on the web, and on twitter. Leah Petersen’s debut novel from Dragon Moon Press, Fighting Gravity is a phenomenal love story set against an epic sci-fi universe where interplanetary travel, ground-breaking scientific innovations and opulent riches are commonplace. Oh, and that love story? It’s a gay love story. The nice thing about her book is that it focuses on those elements, in that order. In fact, I wouldn’t even say the fact that the two main characters are both men is the third most important element she’s woven into this rich story. Class stratification, coming of age and realizing potential are all part of the journey of Jacob Dawes, a too-intelligent-for-his-station kid plucked from the slums of Earth to attend an exclusive academy for the Empire’s best and brightest. Sexuality is merely a detail. It’s refreshing to read about a world where who someone chooses to love doesn’t matter, but rather focuses on why and how Jacob’s character comes to fall for Emperor himself. And it’s the twists and turns, the imperfections and the messiness, of that relationship that’s the strength of the novel. Jacob and Pete are different people, but the magnetism binding them together forces those rough, jutting edges to rub against each other. It truly is a love story about a real relationship. While Fighting Gravity is set in a sci-fi universe, it’s not about the tech or the fancy do-hickey that blasts plasma into antimatter. Rather, it provides a rich backdrop for the characters to populate. 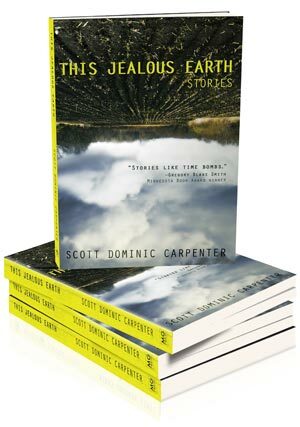 Her depictions of things new and wondrous to Jacob are appropriately breathtaking, but not once does this futuristic world get in the way of the flow of the story. The world of Fighting Gravity feels like a place that exists somewhere down the road, and Petersen is merely returning from a trip to a future, our future, and has chosen to tell us about it through this story of love. Leah is one of my favorite follows on Twitter, and you can find her blogging and knitting away at leahpetersen.com.